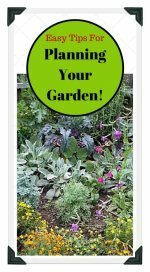 We offer easy tips and plans for gardening in pots, containers, and garden boxes! Learn how to plan and design a potted or container vegetable garden for your porch, patio, balcony or deck. Watch our video below for lots of great ideas for potted gardens. 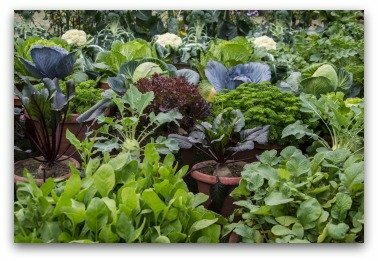 To some extent container gardening is the logical extension of intensive vegetable gardening. The savvy gardener plants by the barrel, bucket, tub, or pot; going to whichever measures possible in making their garden grow to its maximum potential. Potted plants require light soil that is least two foot deep. What Size Pots are Best? When vegetable gardening in pots, vegetables such as squash need up to five gallons of soil medium per plant. 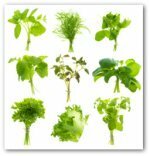 Smaller herb plants can be grown in 4 to 8 inch containers. Because the plants usually have daily watering requirements, the planters must provide adequate drainage. 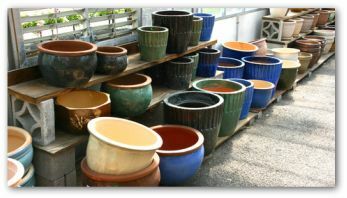 Pots can be a great way to expand your garden. 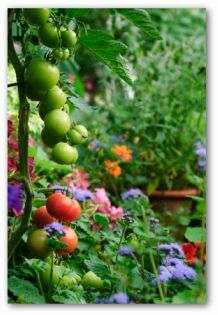 Start with transplants instead of seeding for vegetables such as tomatoes, peppers, and cucumbers and use small compact varieties as much as possible. Using transplants will speed up the harvest date considerably. 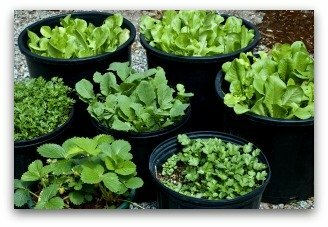 Growing vegetables from seeds will save money, and works well lettuce, radishes, and green onions. 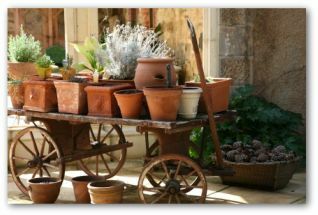 Pots, containers, planters and tubs may be set on a porch or patio, or even in a sunny flower bed or garden. If vegetable gardening space is at a minimum, group the containers in tiers on risers set near the beds. Low walls, patios, and terraces are ideal spots for gardening in pots. Framed beds without bottoms are an easy type of container culture. For these, you assemble a frame on the lawn, patio, or even a concrete driveway. Fill the frames with enriched soil and plant it in the same fashion as a raised bed garden. With this creative style of vegetable gardening, when the season is over, you can disassemble the framed bed for convenient storage. Shallow- rooted vegetables grow best in frame beds. 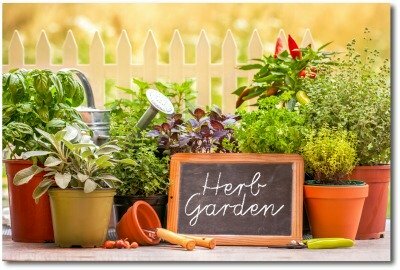 In general, container gardens are easier to prepare, and care for than traditional backyard gardens. However, container vegetable gardens are more susceptible to drying during hot weather. Keep a close eye on your container garden, as it will likely need to be watered every day during the summer months. Also, it is a good idea to fertilize container gardens with liquid plant fertilizer every week during the growing season to ensure maximum production. Containers add to the vegetable gardening space potential without the need to dig more garden beds. In addition to growing vegetables in pots, some types of fruit can also be successfully grow when container gardening. Dwarf fruit trees make spectacular container plantings that can be carted into the vegetable garden area for landscape accent and to encourage pollinating insects. They can also aid the gardener by proving a juicy fruit to be plucked while gardening for a quick healthy snack. Growing dwarf trees is fun and their requirements are few. They do need a humid environment and may require misting several times a week. Other that that, they need direct sunlight and frequent watering as most potted plants. Varieties include dwarf lemon, tangerine, orange, and lime trees. Citrus trees are popular choices for gardening in pots because they can be moved indoors over winter in cooler climates and continue to yield. All container grown trees including even winter hardy species like dwarf apples, cherries, pears, and plums must be given additional protection during cold weather. This is because their roots can be more easily chilled than those of trees grown in the ground. Temperatures of 10 to 15 degrees may endanger roots of potted miniature trees. If you do not have ample room in your home to shelter the pots throughout the winter, to survive the winter chill, they can usually be stored in an unheated shed. Shed storage also has the advantage of allowing you to evade late spring damage by artificially delaying blossom time. Fruit trees bloom later when kept sheltered in darkness. Dwarf trees, like other plants grown in containers for longer periods of time, require periodic repotting. Potted vegetable gardens add versatility to the traditional backyard vegetable garden. Plants that need special care such as pest control or full sun can be moved ideally where they will experience the best growth. 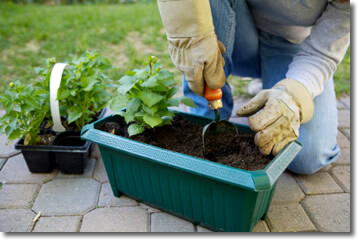 The bottom line to successful gardening in pots is to check the soil everyday to determine if it needs to be watered.